Originally, in Africa, certain types of weaved cloth such as Kente, was created for kings and worn only during events of sacred or extreme importance. One legend has it that kente was first made by two friends who went hunting in a forest and found a spider making its web. The friends stood and watched the spider for two days then returned home and implemented what they had seen. The dazzling strips of Kente are identified by multicolored patterns of bright colors, geometric shapes and bold designs. Some designs had specific names and meanings reflecting values and historical events. 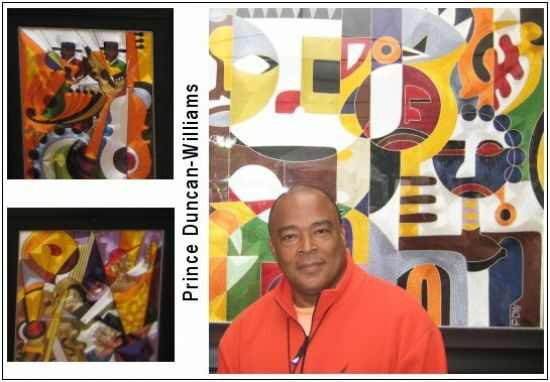 Similarly, Prince Duncan-Williams, a native of Ghana, Africa, currently living in Nevada, has been able to morph and amalgamate the talents possibly introduced by the forgotten master weavers of Kente first located in West Africa as early as the 11th century. However, Prince does not create Kente but rather creates a more modern and global visage of symbols reflecting a wide cultural landscape that includes the commoner as well as the king. In addition, his silk and rayon thread creations inject multiple themes but also his inspirations � jazz music, Picasso, native art, rhythm, and harmony. The following is an interview with Prince Duncan-Williams at the Cottonwood Festival. The interview was done on May 3, 2009, in Richardson, Texas. William: Prince Duncan-Williams. The artist from Africa, originally from Ghana but now based in Las Vegas. Renata: Okay. Tell me about your artwork. William: Actually, I learned this in 1996 when my dad passed away. I went to Ghana. Its called fiber but its actually thread. All the threads are actually hand laid and glued evenly thread by thread until the whole process is finished. Renata: How do you get the vibrant colors? William: The vibrant colors � actually I buy the thread from Africa, I can�t find them here. So the vibrant colors are African colors, my native colors, you know from Ghana. That�s where I get my threads from so that�s what you see. Renata: All right. How long does it take for you to create a piece? For instance, this piece is what size [SHE POINTS TO A BIGGER PIECE]? William: That�s a 36 by 48. (The time it takes varies). Getting the sketch right is actually most of the work. To get the sketch right where I think this is it [HE POINTS TO A PICTURE AND SMILES]. Renata: How long is the sketching process? William: The sketching process can take, probably, sometimes it takes 2 hours at night for approximately 30 days to get it right to this is It [HE POINTS TO A PICTURE AND SMILES]. Renata: What is your inspiration? William: Music � which is jazz. Yea! Renata: Soft jazz, Fusion Jazz? William: [LOOKING UP AND THINKING] Yea, well really all kinds of jazz, actually I would say. But Paul Hardcastle is one of my favorite guys (musicians). Renata Great! So after you do the sketching for thirty days on-and-off. Your process after that? William: What I do then is I sketch the art on a bigger scale on the board or the cardboard and then I spray glue all over and then I follow the sketch with a black thread as you see [HE GESTURES TOWARD AN AREA OF A BIGGER PIECE] you know. Once that is done, I go back in different sections with different colors of thread. I work from the outside to the inside with the threads. If you work from the inside out in the sections, you are not gonna get it right. Renata: I see. So how many years have you been doing this? William: I have been doing it since 96 so like I said my dad passed away and I went back home and saw my cousin doing it and it actually caught my eye and he inspired me to learn but the hardest part was getting the technique right. Getting it down and messing with the glue. Renata: So would you say it is a generational, family art? William: I wouldn�t say so. No, NO, NO. Because he (my cousin) learned it from somebody else. However, there are not too many people that are doing it. Actually (in fact), as I told you (earlier), at the scale as you are seeing here, its only two people that are doing It in the whole entire world and that is me and my cousin that do It on this scale. Renata: So this is the smallest? William: No, the smallest is probably half the size of that [POINTING TO A SMALLER PIECE APPROXIMATELY 20x30]. Renata: And that would be dimension wise? Renata: And can your work be viewed online? Renata: Is there anything you would like to add? William: I'll say go on my website, take a look at my art. Renata: What is your web site? Renata: They are all musically inspired, correct? William: Yes, in my native country. Ghana in north Africa. ForgottenGreats.com is pleased to interview this artist who uses threads and cloth to create art and represent the similarities of an art form that is often �forgotten� by many people. However, in other areas of the world, this art form is a way of life. As a result, many of the areas that incorporate cloth and threads into their way of life have been forgotten as well and ForgottenGreats.com hopes to educate our readers with articles and other artists in the near future.